Are you thinking about having an affair? 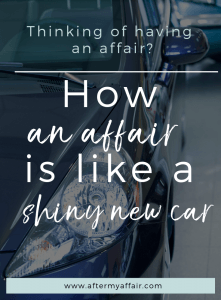 First read how an affair is like a shiny new car. Have you ever bought a brand new car right off the car dealer’s lot? Do you remember that feeling, and the excitement you felt, when you first started looking at new cars? There’s just something about that new car smell. I have to admit, I’m kind of a sucker for it all. You finally pick one out. It’s the perfect shiny blue color you were looking for. There’s the thrill of discovering how each feature works, like the navigation or programming your phone’s bluetooth. It’s all new and exciting. After driving it off the lot, you’re beaming with pride. Maybe you vow to yourself to faithfully wash it each week, and you consistently park far away from other cars to avoid getting dings. As for me, I always tell myself I’m going to keep this one clean and polished. And I’m sure that I won’t be eating in my car, at least not for awhile. That lasts for a few weeks. But eventually, I stop finding time to wash it, and polishing it takes too much time. And hey, I live in Colorado where keeping a car clean for more than 2 weeks is miraculous. between that space next to my seat and the arm rest. #don’t judge. Then it happens….the first scratch, ding or stain on the seats. I hate those. It didn’t stay so new, clean and fry-less for very long did it? Our relationships are a lot like that. Our spouse was once just like that shiny new car. We took care of the relationship. We were excited and proud of it. We protected it, and made sure to ‘park’ far away from danger and other threats that could damage it. Then life happened. We got busy. Words were spoken harshly to our spouse, carelessly left behind without thinking of the damage caused. Familiarity has moved in; giving way to laziness. Then carelessness in our words and behaviors, started to erode our most prized relationship-our marriage. Kids come and, if we’re not careful, the stains on the carpet of our relationship becomes stains on the seats of our love. We begin to give up trying so hard to keep things clean. It takes too much effort. Anger and resentments grow, as the expectations of our spouse and marriage go unmet. We learn coping mechanisms to communicate and some are not healthy ones. The effort to buff out scratches becomes too much as we start to give up. They’re only small scratches, we think. The paint becomes dull, and we start to wonder if it’s worth all the effort to wash it again. It’s just going to rain and get dirty again soon, we reason. Our marriage relationship can be hurt with our lack of effort, too. We may start to slack off on making the effort to work things out with our spouse. We may wonder “why bother trying to resolve this argument, my spouse is just going to get defensive and we’ll end up fighting again”. Or, we neglect the date nights or time together with our spouse we used to be so diligent about. It’s always the little infractions and the small neglects that eventually add up. Each little grudge builds up without talking about it. Every day without connection is like another ding in the door of our marriage. Until one day, we wake up to find an old beat up, junky car in the garage where our pride and joy once was. On the bottom is rust, hidden from others maybe. The once shiny blue paint is hard to see beneath all the layers of grime and filth. It’s easy to be discontent with such a mess and wonder how could you ever have liked this beater? The effort to get it washed, repaired and restored is too much now, you think. It’ll cost too much. It’ll never be like it was when it was new, we often think. Just like we do in our marriage relationship. and neglect the relationship we used to make more time for. It’s easy to take each other for granted, like an old car where we know how everything works and are familiar with its features. But love goes in stages and the beginning is the limerence type of love when everything was new and fun. Their lover can do no wrong. has weathered some storms together, and they know there are faults in their spouse, but they choose to love them anyway. But if we’re not aware of these normal stages, we can easily let discontentment and disillusionment grown in our hearts. Or we get bored and stop trying. That’s when we might start believing that a new car would be the answer. Just like we might be seduced into believing someone new would be better than our spouse. Getting into an affair is as promising as a new car. This new person appears to be all the things you need. So you’re ‘car shopping’ again. Thinking somebody new will give you that thrill. And for a season, you might feel excited and in love again. Life soon feels better and you’re having fun in your new car. Feelings of guilt and worry over the monthly payments creep in but you just repeat to yourself that you deserve this shiny new car. While your old beat up blue car still sits in your garage-ignored and collecting dust. Our lives can be a lot like that. Why do we sometimes get complacent in our marriages and not try to cultivate the love and connection with our spouse anymore? How can we find it so easy to neglect the maintenance needed on our marriages, that’s needed to keep it running well. The double car garage houses both cars, representing the double life you now lead. Trying to keep both an affair and a marriage going is exhausting, we find ourselves ambivalent and confused. And that’s not how God designed it to be, friend. But the marriage is no longer the priority. The new relationship takes all your attention. The other car no longer meets your needs and you’ve outgrown it. Then the first payment comes due. The payment you really can’t afford while still being able to eat the rest of the month. But the payment will always come due. pen right away, but it’s going to cost you eventually. Perhaps you were able to keep it a secret for a while, but the payment (consequences) will eventually come calling. Soon, It’s time to pay up with money that you really don’t have. And the creditor of infidelity has no mercy, my friend. He’ll go after your family; your kids will be heartbroken, and your marriage will be ripped to pieces as payment. So, don’t fool yourself, there’s always payment. There’s always consequences. That payment is pain. 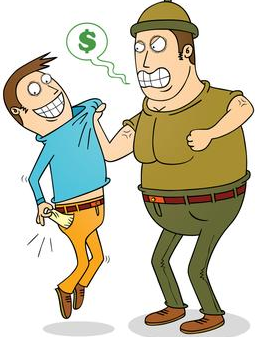 The debt collector doesn’t care if you’re a Christian, or that you ‘didn’t think you would ever do such a thing’. Then it inevitably happens. The new car gets a dent. The leather gets a rip. You try to cover it up, but the rips grow wider. You notice quirky things you didn’t notice at first. It idles rough in neutral. It leaks oil and is making a mess of your garage floor. You start to realize this shiny new car is not as appealing as it once was. It’s costing more than you realized and the problems are adding up. There are different issues than with the old car, but the problems are still there. That’s what happens with affairs. We just trade our old problems with our spouse for new problems with somebody else, eventually. We tell ourselves this new relationship is different, that it will last a lifetime because of these wonderful euphoric feelings we feel. But the statistics aren’t in favor of that idea. 90-95% of marriages end, when they started out as affair partners. If they even divorce their current spouse, and make it to marriage. Most affairs will fizzle out, before marriage ever takes place. Yes, marriages take work, and it can be really hard. However, it still costs less than having an affair. Trust me, the grass is not greener on the other side. office of marital counseling, personal counseling, prayer and humility. So, take those funds you would have used on a new car, and work on the one you have that’s sitting at home in the garage. It may take time and it may be a slow process. But at least you’ll walk away with your integrity, and family, still in one piece and you won’t have to face the payment of pain later. If you’ve already made the mistake of having an affair, why not pick today as your day to end it? Because that ‘new car’ will eventually have shriveled french fries under its seat one day too. « Would your affair partner make a good spouse? I just found your site and am recently trying to work my way through an emotional/almost completely physical affair. I appreciate this site as it speaks to me as a Christian and woman. This is a very difficult time and I question what path to choose or what I want. Thank you for taking the time to reach out. I apologize for the delay in responding. In response to your question on what path to choose and trying to discern what you want, I would say it is VERY difficult to think clearly when you’ve been in the midst of any type of affair- emotional or physical. Your emotions are tugging at you and the voice of God can get muffled under your wants and ties to this person. But that is also a very emotionally and spiritually draining place to be in. You know in your heart what the right thing to do is. Cutting off contact with this person is the only thing you really can do. I suggest finding a good, compassionate Christian counselor soon. Someone you trust to help you walk through this. You can find your way back to God and a healthy place, but it will take work on your part to not give in to the temporary desires to escape into this affair. If you continue down this path to a completely physical affair, I can guarantee you, it will be heart wrenching and that much more difficult to break it off later. There is still hope for you though. Find a good counselor to help you navigate through this and learn WHY you detoured into this affair and what healing needs to take place in you to get past it. Thank you for reaching out Jasmine. Jasmine, I hope you got my reply back in May but I’m going through my inbox and see I didn’t hear back from you so I’m just reaching out. I am so sorry you’re dealing with this. There are many temptations and road blocks to lead us away from our marriages, there is an enemy who hates marriage and family. I don’t know where you are now with the affair, but you mentioned it was almost physical. I’ve been there and know from experience that continuing contact with that person will lead you down a road you don’t want to go. You might already know that though. What is your biggest struggle and question right now? You stated wondering which path to choose. I was also confused and wondered the same thing. It is the nature of being in an affair of any type.